Luxury Real Estate Marketing: Are You Riding the Wave of Change? The picture above was taken in our local neighborhood here in the Santa Barbara area. It tells an important story about our economy, but not necessarily the story you may have in mind. It is a manifestation of a mega-trend, a wave of change in the delivery and distribution of movies, a change that has been coming for over twenty years. As a luxury real estate marketing professional it is essential to anticipate trends in your local marketplace so that you are not caught off-guard. Positioning yourself or your company to ride the new waves can propel you to greater heights. In the early 90’s, when we owned our commercial real estate firm in Beverly Hills, we worked with Blockbuster Video to open a neighborhood location. They were almost as aggressive in penetrating the market as Starbucks at the time, opening locations at breakneck speed. At the same time the internet was just taking off, but not yet in the mainstream. The new light-weight media of DVDs that could be inexpensively mailed to customers and watched either on TV or on a computer, made it appear that Blockbuster’s brick and mortar days were limited. When Netflix introduced an online service offering movie suggestions based on personal preferences a superior customer experience was born. Plus, there was no late fee for tardy returns. Today, you can rent movies from a kiosk in your local marketplace for $1 or you can purchase them via your cable or satellite TV provider without waiting for the mail. Meanwhile, with over 100 internet video on demand platforms, including Apple’s iPhone and iPad, Netflix has become a globally ubiquitous brand. Consumers have now come to expect their movies on-demand as soon as they are released on DVD. Except for major “blockbuster” event movies, like the soon to be released two-part finale of Harry Potter, why pay more at a local theatre when you can enjoy it on your huge HD TV screen right in your living room or on a mobile devise if you are a road warrior. Although, the movie industry has seen a modest increase in overall revenue this past year there has been a decline in actual movie attendance. It was the higher average price per ticket that caused the increase in revenue not the number of actual sales. 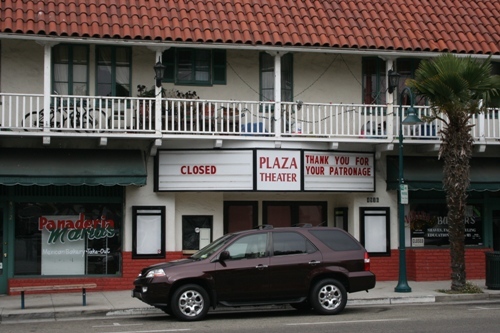 Is the closing of a local theater a sign of a slow economy or is it a sign of the Titanic shift in the technology of delivering and distributing movies?